Its model number and name are #085 / Starman. Character Bio - Theodore Knight was heir to one of the largest fortunes in Opal City, but money and high society held no interest for Ted. Instead, Ted had always found himself drawn to the stars. An amateur astronomer and brilliant young scientist, Ted made an astonishing discovery about an unknown form of stellar radiation. Harnessing this energy, Ted developed the Gravity Rod, and later the Cosmic Rod. At first, Ted intended to use the Gravity Rod as a power source, but it was the Golden Age of costumed superheroes, and the world had other ideas in mind for Ted Knight. 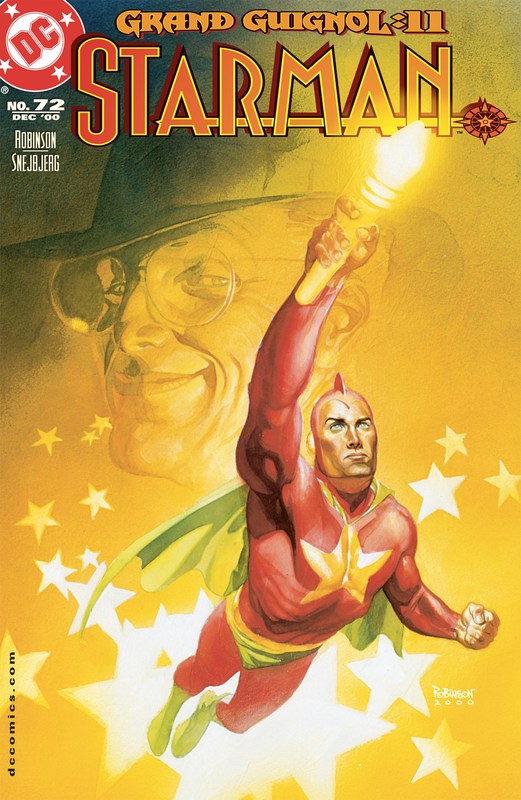 At the urging of his cousin, the Phantom Lady, Ted donned a costume and began fighting crime under the alias Starman. Protector of Opal City, Starman fought against and stopped villains like the Prairie Witch, Bobo Benetti, and his arch-nemesis The Mist. Ted was one of the best and brightest of the young generation of superheroes, but after the loss of the woman he loved and his involvement with the creation of the atom bomb, Ted suffered from a nervous breakdown and hung up his tights. This was not the end of Starman though, and many others would take up the mantle in the following years, including Charles McNider, Mikaal Tomas, and Ted's two sons, David and Jack. It was the latter two that made Ted most proud and, even after David's unfortunate death, Ted encouraged Jack in his time as a hero. During this time, Ted turned his energies toward inventing, feeling that he could help the world in other ways. He had not seen his last adventure as Starman though. When his old nemesis, The Mist, once again threatened Opal City, Ted once again became a hero. Using a more powerful version of his Gravity Rod, Ted carried an entire skyscraper, with The Mist and his city-destroying bomb inside, up into space. Though the exertion of this killed Ted, he could rest easy, knowing that Opal City was once again safe and at least he would die closer to the things he had dedicated his life to, the stars. As a Mystery Man, Starman has these Mystery Man Synergies. As a figure with the Flying special power, Starman cannot be affected by aspects of certain special powers. Current Special Powers that Interact Differently with the Flying special power. As a figure with the Brilliant personality, Starman adds 4 when rolling the 20-sided die for the Glyph of Replicator. As a Human, Starman interacts differently with certain special powers. Current Special Powers that Interact Differently with Humans. 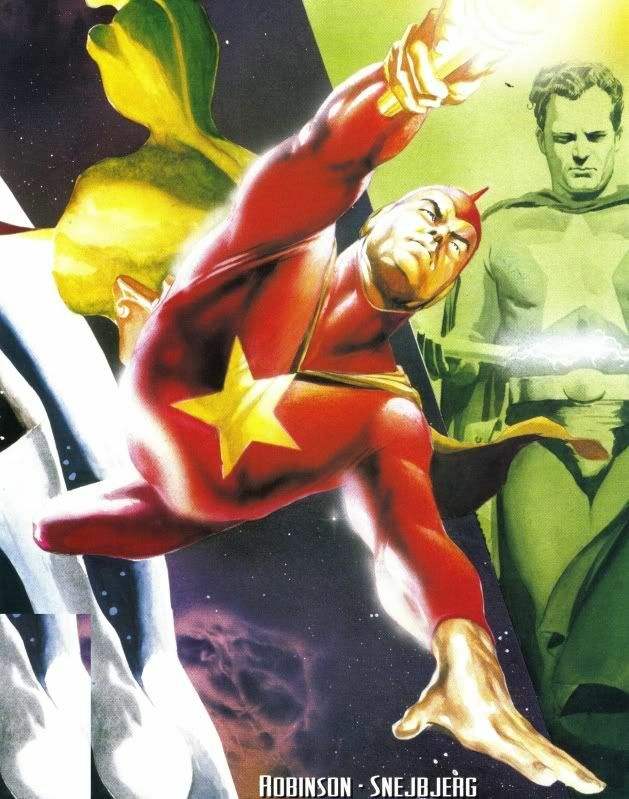 As a figure with the Flying special power, Starman can be affected by aspects of certain special powers. Current Special Powers that Interact Differently with the Flying special power. Last edited by Ronin; November 13th, 2017 at 12:27 AM. At the start of the game, after Order Markers are placed and before initiative is rolled, you may choose either a Glyph of Cosmic Converter Belt, a Glyph of Replicator, or a Glyph of Shield Belt and place it on this card. Choose an empty single or double hex land terrain piece with one or more terrain pieces underneath it within 4 spaces of Starman. Remove the terrain piece from the battlefield, then place it on any empty space within 4 spaces of its original placement. After placing, you may choose a figure adjacent to the moved terrain piece and roll 1 unblockable attack die against that figure. Starman can equip a glyph even if there is an Equipment Glyph on this card, up to a maximum of 2 and cannot lose these Equipment Glyphs by any means unless he is destroyed. If Starman is equipped with the Glyph of Gravity Rod, he gains the Flying special power, and may change his Range number to 5 and his Attack number to 4 when attacking a non-adjacent figure. Starman may choose two or three hex terrain pieces when using the Glyph of Gravity Rod. When Starman rolls the 20-sided die for the Glyph of Gravity Rod, he may add 8 to his roll. Instead of attacking with this figure, you may choose a small or medium figure or an empty single hex terrain piece within 4 clear sight spaces of this figure and roll the 20-sided die. If you roll an 16 or higher, place the chosen figure or terrain piece on any empty space within 4 spaces of its original placement. After the figure or terrain piece is placed, you may choose a figure adjacent to the moved figure or piece and roll an unblockable attack die against that figure. Moved figures will not take any leaving engagement attacks. When this glyph comes into play, place 4 white Dazzle Markers on this card. After taking a turn with this figure, you may choose an opponent's Unique Hero within 5 clear sight spaces and place a Dazzle Marker on its Army Card. A figure with one or more Dazzle Markers on its card subtracts 1 from its Move, Range, Attack, and Defense numbers to a minimum of 1. Figures with the Sensory Assault or Radar Sense special power are not affected by this glyph. At the end of the round, any of your Dazzle Markers from this card that were placed on other cards are removed from the game. Last edited by TrollBrute; April 10th, 2016 at 09:24 AM. I wasn't sure if glyph threads were created at the same time as the figure thread or if that was done later. I figure the glyphs are subject to changing, so it was better to have everything in this thread at the start. Instead of attacking with this figure, you may choose a small or medium figure or an empty single hex terrain piece within 4 clear sight spaces of this figure and roll the 20-sided die. If you roll an 16 or higher, place the chosen figure or terrain piece on any empty space within 4 spaces of its original placement. After the figure or terrain piece is placed, you may choose a figure adjacent to the moved figure or piece and roll an unblockable attack die against that figure. If you roll a skull and you moved a figure, the moved figure also receives 1 wound. Moved figures will not take any leaving engagement attacks. As before, I worry about adding too much text to a glyph power, but I'm otherwise cool with the change. Why would he ever not choose Gravity Rod with all his other powers based on it? You wouldn't, really. It's his most iconic invention, so I'm okay with that. I could see changing the stat boosting power to work with the Cosmic Converter Belt as well, so that the Rod is less of a "must choose". Or you could have him start with the gravity rod and choose one of the other 3. Last edited by TrollBrute; November 11th, 2015 at 09:19 PM. As currently worded, Invention Cache makes it seem like he can just pick up any old equipment glyph of his choosing and not lose, but I think your intention was just those listed in the power. Yeah, the "these Equipment Glyphs" phrasing feels a bit nonspecific. Could probably use a tweak. Gravity Rod is a lot of fun, but I don't quite understand the theme behind the Belt. Mind giving a brief rundown on it? I find the other two choices somewhat odd, but I imagine they have thematic backing so I can't complain. He's definitely a "one-trick pony" design, with Invention Cache being pretty much the only relevant power (the other two merely being buffs for the Glyphs he starts with), but it limits complexity by a mile so I'm a big fan of that. I still support this change. For Gravity Rod Training, I think it could probably be simplified to just boosting his range; it seems like unneeded complexity to state 5 range/4 attack. Also, couldn't Gravity Rod Training and Attuned to its Power be combined into one? Otherwise, I really like this write-up. I'm really excited to see Ted get a design! Starman can equip one of these glyphs even if there is an Equipment Glyph on this card, up to a maximum of 2 and cannot lose these Equipment Glyphs by any means unless he is destroyed. @Viegon , I'd support bumping his Attack by one, dropping the Attack boost from Gravity Rod Raining (which I'd like to change to Gravity Rod Affinity) and combining the two powers. The Cosmic Converter Belt can "shoot stars" that blind and disrupt people. It was invented by Ted, but also used by the Star-Spangled Kid and Stargirl, so it could be re-used for their designs. The Replicator is their because Ted is a genius that can easily whip up crazy inventions. The Shield Belt is something that he could easily have invented in the Golden Age, and a lot of the Legion of Superheroes' technology is based on his work, so it's a nod to that. I was thinking of Deadpool's Teleportation Belt rather than the Shield Belt; yeah, that makes perfect sense, ignore me. The way the Cosmic Converter Belt is worded he presently subtracts 4 from his Move, Range, Attack, and Defense until he starts dishing them out. I'm pretty sure you guys don't want a 1/1/1/1 figure. "Starman can equip a glyph even if there is an Equipment Glyph on this card, up to a maximum of 2 and cannot lose these Equipment Glyphs by any means unless he is destroyed." Is there any reason not to change this to just make it so he cannot lose Equipment Glyphs by any means unless he's destroyed? The use of "these" seems more confusing than it's worth, IMO. I think you're getting confused because he put everything in the same OP here, but the glyph would have its own card and the markers would initially be placed on the glyph's card per the glyph text, not on the Hero's card. So this wouldn't be an issue. On to general comments: I like the overall take on him. In interest of making him a tad less complex, though, and of avoiding the really annoying gameplay issues that come along with removing terrain pieces during the game* I'd suggest adding Viegon's portion to the Gravity Rod, then cutting the parts of the Gravity Rod that let you choose terrain and move terrain. Moving figures is super powerful in the metagame by itself, provides plenty of complexity and utility for the Gravity Rod, and terrain removal in-game can be really annoying (and destabilize maps). Also, you'd really trim down on the complexity of the overall character if you made that change (including dropping the third special power, which is the one I like the least anyhow). It might make players feel less like the Gravity Rod is a default choice, but I'm not sure if that's terrible, and getting Flying and a Ranged Attack is probably enough to make it a default choice anyhow. *I know, I know, I LDed Galactus, but he has an entire rule set to go over this stuff, he's an Event Hero, this is pretty much the main thing he does, and it was almost thematically unavoidable. As Bats said, the markers go on the glyph's card, not Starman's. Like I said above, I could roll with that. I strongly disagree here. I don't see where moving terrain (only small pieces, only if you give up an attack, and only if you succeed a D20 roll) is that annoying. What situations worry you? If it's a balance issue, I'll concede it, but otherwise, I think it adds a lot to the figure. It's certainly something Ted can do, and it's a big part of his most iconic modern story (sacrificing himself to lift a skyscraper out of the ground and defeat The Mist). The rules for moving terrain are already in place thanks to Galactus, so there's really nothing we need to go over in terms of FAQs or new rules. Why go through all the bother to create an entirely new ruleset if we never actually use those rules? If you remove the terrain movement, Starman becomes yet another thrower with minor synergy. With it, he's exciting, he's fresh, and he's more thematic. Why not do it?